It’s hard to imagine America without the pick-up truck. From farms to freeways, the pickup is everywhere. Yet for pickup truck enthusiasts, understanding the history of these beloved, functional vehicles is a fascinating one. Born of necessity, the pickup is, truly, part of America’s automotive history. Here are some interesting facts about the history of the pick-up. When people needed space to carry stuff in the early days of automobiles, they added beds to their cars. However, in 1925, Ford produced the first factory-assembled pickup trucks, using their patented assembly line process. This was the first mass produced pickup truck in the industry. The first Model T trucks had an open cab. For three years this was the only truck that was being mass produced. In 1928, Ford made a major change when it added the closed cab, creating the Model A.
Ford did what it did well, and it’s Model A trucks, which were basically a truck bed on a typical car frame, was the main truck for a couple of decades. 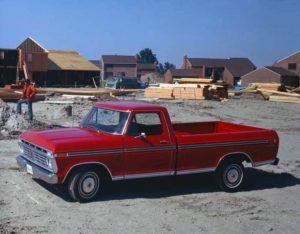 However, popularity for trucks, as well as the demand for trucks that could haul and perform work, began to grow. In 1948, Ford introduced its first F-Series truck. This was the first truck built with farm life in mind specifically, and it revolutionized the pickup truck industry. In 1954, Ford produced the first factory-produced pickup truck with a V-8 engine. This engine, which some consider to be essential for a work truck, was considered a major milestone for the pickup truck design. In 1960, a full 35 years after Ford introduced the pickup truck, Chevy entered the scene. It released its C/K line of pickup trucks, which ended up bringing the model of trucks that would be used by many manufacturers for years to come. While late to the game, Chevy’s contribution was a big one. In 1966, Ford proved that it had innovation in mind again when it introduced its crew cab design. This added another row of seats, so trucks could be family vehicles. This also made trucks more useful on the worksite, as more workers could pile in the truck while it still hauled a tow load. Many other brands would duplicate what Ford introduced, paving the way for the modern pickup truck we know and love today. With the F-150, Ford releases one of the best selling vehicles in the United States, and that has stood the test of time. By the end of the 20th century, the need for powerful trucks was at its highest. Ford Super Duty rose to the call, and continues to provide a powerful commercial truck for the industry. After the introduction of the compact crew cab to the US market with the Nissan Frontier in 2000, pickups made the switch from a work vehicle to a primary vehicle. Many people were buying trucks to just have as their main vehicle, even if they had no intention of using them for utility reasons. Today, it’s not uncommon for most families to own a truck, even if all they use it for is to drive to the office. When you head to the dealer to purchase your next truck, take a step back to appreciate the history of the pick-up that got you from a car with a bed on it, to the beautiful, functional vehicle you are about to purchase. Through innovation and design changes, the pickup has become a staple in the American automotive industry. Photo Credit: © Ford Motor Co.